A first class air and car show with plenty of variety for the whole family, including an action arena, extensive vintage military 'village' with vehicles and re-enactors, vehicle zone, nearly 2 hours of vehicles on the track and lots of period entertainment. After a long association with the August Bank Holiday Weekend, the show returns to its original June slot for 2019. The 'wings' part of the airshow includes air displays totalling around 5 hours each day, featuring a mixture of civilian and military aircraft, with a good variety of WWII and modern types. The 'wheels' element includes a parade of vintage and military vehicles close to the crowd line and more distant runway demonstrations of historic and modern supercars and bikes. There will also be trade and wings and wheels related stalls, rides and amusements. The days of Dunsfold Wings 'n Wheels have been numbered since the decision to develop the aerodrome. It is now known that the 2019 show will be the last. The Event Director, Jamie McAllister, has not put this down to the proposed development but to difficulty 'putting on the best airshow in in the current aviation and economic climate'. Dunsfold airfield was built by the Royal Canadian Army in 1942. It was originally an emergency airfield and sometime home to B25s, Mustangs, Spitfires and other WWII craft. Following the war, the airfield was a repatriation centre which handled over 47,500 prisoners of war and also played a part in the Berlin airlift in 1948/9. The airfield was involved in the development of the Harrier, Hawk, Hunter and other aircraft when it was owned by Hawker Aircraft Company Ltd (now part of BAE systems), but after nearly 50 years of Hawker / British Aerospace history, it was finally closed in 1999. The aerodrome is currently a private unlicensed airfield, part of an industrial estate, a location for practice flights by the Chinook amongst others and home to 'Top Gear'. Dunsfold provides a varied mix of displays although, as is the case at many shows, the core doesn't change a great deal from year to year. At Dunsfold, though, there are generally a few specials, such as local débuts or feature displays, and 2018 was no exception. This year one of the specials was a very emotive tribute by Peter Teichman in Biggin Hill Heritage Hangar's Hurricane, accompanied by Tom O'Bedlam reading the poem 'High Flight'. The tribute was to the late Duncan Simpson and John Farley, former BAE Systems chief test pilots at Dunsfold, who were involved in the testing of some of the most famous aircraft including the Hunter, Harrier and Hawk but who died during the year since the last Wings 'n Wheels. John Farley was also a former Manager of Dunsfold Aerodrome. Another special was to have been the Westland Whirlwind, but this was a late and very disappointing cancellation, not least because it was probably one of the principal draws for many of the visitors. However another, the re-engined Sea Fury, did give a brilliant display alongside the MiG-15 in a mock battle, enhanced by strafing runs and pyrotechnics, as did Wings and Wheels débutante, the OV-10 Bronco, from its rapid-ascent take-off and throughout its routine, which demonstrated the versatility of the unusual-looking aircraft. Before the air displays on both days, the Brooklands Museum VC10 announced the opening of the wings part of the show with a engine run. Other Saturday displays are listed in the table. 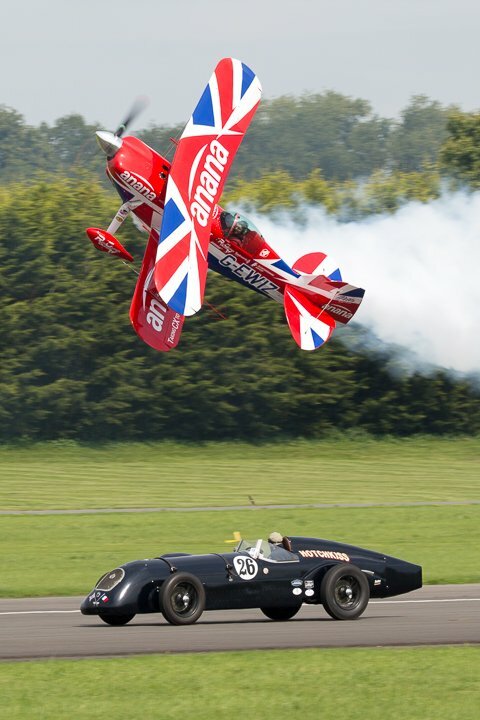 Notable were the display of the Norwegian Vampire pair with their traditional tight display, Richard 'no-fears' Goodwin, who was as bonkers as always, and another crowd favourite Chinook, which included Dunsfold in the relatively short list of venues that were treated to a display in 2018. A glorious, if chilly, Saturday gave way to a wet and windy Sunday. To maximise the chance of flying, the programme was brought forward but inevitably there were many cancellations, including the Red Arrows, who couldn't escape from the bad weather at Brize Norton. On the positive side, and despite the weather, there were still flying displays, beginning with the irrepressible Brendan O'Brien who was first into the air with an unscheduled outing in Otto, complete with smoke and fireworks. Take that, British weather! Other stalwarts in the gradually deteriorating conditions were the Fireflies, the Bronco Demo Team, the Blades and the Chinook. 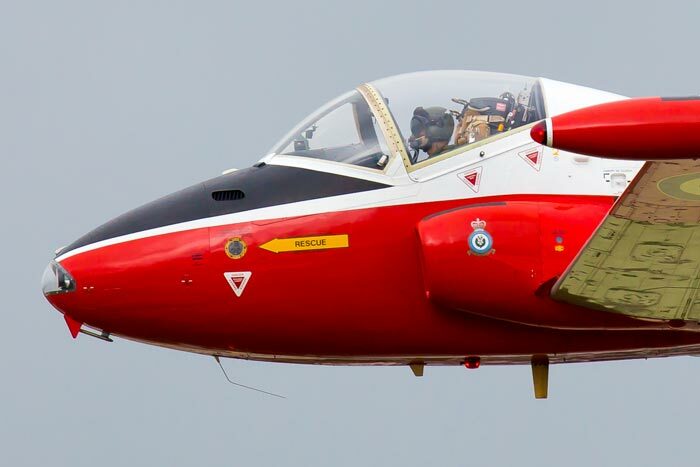 Mark Petrie also made a valiant attempt to display in his Strikemaster and did manage several flypasts but was not able to fly safely in the heavy rain and high winds so aborted the display. The remaining displays also cancelled except one that was only seen by the commentators, Melvyn Hiscock and Brendan O'Brien. Thankfully they were able to describe the mystery 'stealth' aircraft, with pyrotechnics, that was so stealthy it was invisible to everyone else. Whether it was imagination or wishful thinking, it was proof that it was only the ground and not the spirits that were dampened. The ground displays, military zone and trade stands did endure for a while longer but, as everything gradually closed down in the now-soggy aerodrome, the proceedings came to an early close at around 15.00. Many airshows set out to provide entertainment for the whole family. Some succeed. But few succeed as well as Dunsfold Wings and Wheels, with plenty to suit all ages and most tastes. Motor enthusiasts had plenty to fill their day with two vehicle runs close to the crowd line, two fast runs down the runway and a large area of the arena where motors of all descriptions could be viewed and where visitors could compare notes with owners and fellow enthusiasts. The military village had more re-enactors and genuine war-era vehicles than most shows: the youth bike team showed their skills over obstacles and the professional equivalent defied gravity in his tower of death. By contrast, there were also crafts, charity stalls and an excellent vocal trio to keep everyone entertained with vintage melodies until long after the flying had finished. But our main interest is in the aircraft and there the show deserves many plaudits. 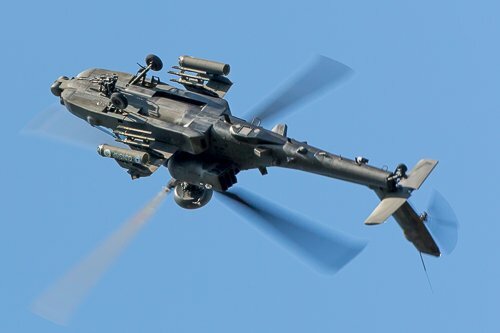 This year Dunsfold Wings and Wheels is one of only five shows in the UK to get the Apache display, complete with a role-play, a demonstration of its features and the now-famous wall of fire finale. Another rarity on the airshow circuit this year is the Chinook, which displayed at only eleven public airshows in 2017. Again Dunsfold is one of those few and one of only 3 shows to get both the Apache and the Chinook. Add the Red Arrows and the Typhoon and it becomes clear that both the Army and the RAF are great supporters of Wings and Wheels. The main missing link was the BBMF's Lancaster. 'Leader' had been scheduled to display alongside a brace of Spitfires but the show coincided with the interval during which most displays by BBMF aircraft had to be paused whilst their engineers dealt with a Merlin engine issue. The Flight did everything they could, though, and sent Sqn Ldr Andy Millikin to display their very busy Mk XlX Spitfire, which has a Griffon engine and so was unaffected by the Merlin malaise. Amongst other fighters of the era were Boultbee Academy's P-51 Mustang 'Miss Helen' flown by John Dodd and Hangar 11's Hurribomber, brilliantly flown, as always, by owner Peter Teichman. These types both have strong connections with Dunsfold, the long-time home of the Hawker Aircraft Company and the wartime base for Mustangs operated by the Royal Canadian Air Force towards the end of the second world war. Another, dynamic, warbird display came from the pairing of Mk lXb Spitfire MH434 and the Buchón painted to represent Messerschmitt Bf109 'Black 8', piloted by Brian Smith and Steve Jones respectively. 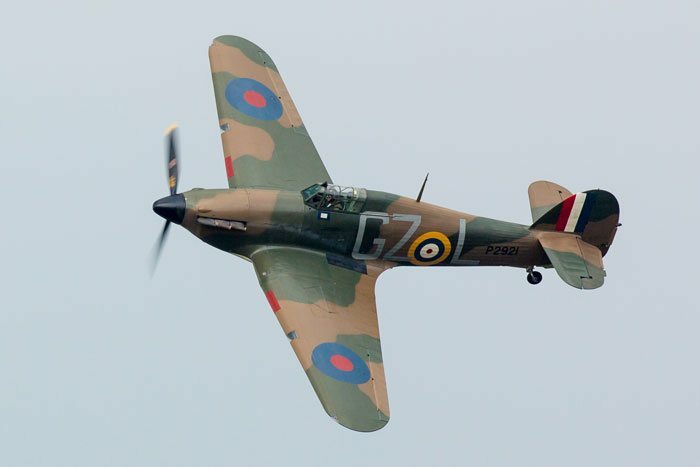 The pair demonstrated an attack on the airfield, complete with pyrotechnics and streaming smoke following a successful hit by the Old Flying Machine's Spitfire on the Aircraft Restoration Company's pretend Messerschmitt. The military and wartime displays are firm favourites but the show had some of the top of the civilian displays as well. In particular, the astonishing Rich Goodwin was as spellbinding as he always is. His display at any show is amazing but at Dunsfold he added little extra in the form of a couple of passes before and following his aerial display, not with another aircraft but with a vintage Hotchkiss racing car. Opening the show on both days, before joining Melvyn Hiscock for their customary informative whilst humorous commentary double-act, was Brendan O'Brien in his yellow Piper Cub. Brendan, the best worst flyer, showed how not to fly, whilst showing how well he really can fly, in a crazy display before successfully landing - and taking off from - a trailer being towed along the runway. If that doesn't make sense, this YouTube video might help. Wings and Wheels does not pretend to have as elaborate a ground-based aircraft display as many aerodrome shows. But what it does have it displays well and always offers a little extra when it can. Last year it was a ground run by the Brooklands VC10 and at one stage a repeat was anticipated for 2017. In practice, that fell off the agenda but the Brooklands giant's engines were powered up twice on each day of the show for about 15 minutes each time. Outside those times the VC10 was open for visitor tours, as was the resident Boeing 747. Other residents on display were Aces High's 'film stars' including their C-47 'Skytrain', plus a small number of visiting machines. These included a pair of Hawk T.2s and two Tucanos, one in the special Battle of Britain livery to celebrate the centenary of 72(R) Squadron. The static and flying aircraft are listed in the table. 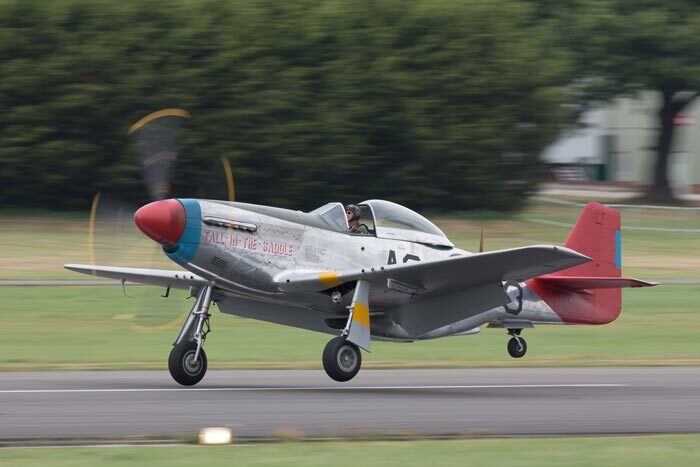 With a participative static display, excellent and varied entertainment around the grounds and a flying display that invariably includes the best of the military and civilian aircraft available, Dunsfold Wings and Wheels is an airshow - and more- not to be missed. Next year's date for the diary is 25th and 26th August. 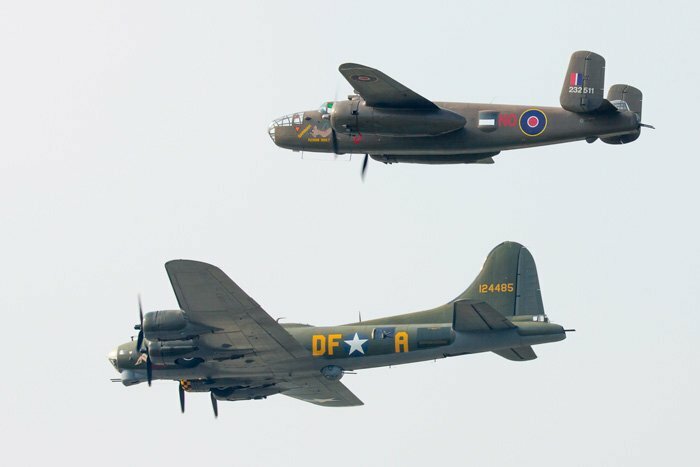 A B-25 and B-17 pairs take-off and VC10 fast taxi were just two of the highlights of this Bank Holiday weekend show at Dunsfold Aerodrome. Despite tricky weather over the weekend, virtually everything left on the programme flew; the exceptions being the Scout from the Historic Aircraft Flight, which became unserviceable, leaving their Sioux to display on its own, and Peter Teichman's Hurricane, which was also unserviceable but was replaced by Peter flying Mk1 Hurricane P2921, borrowed from the Biggin Hill Heritage Hangar. Unfortunately, there had already been several other cancellations (see the table) and much of the RAF involvement this year had been curtailed because of the withdrawal or shortened season of teams. Nevertheless, Wings & Wheels still got the Red Arrows, the Typhoon and a BBMF Spitfire pair, as well as the Royal Navy's Black Cats. 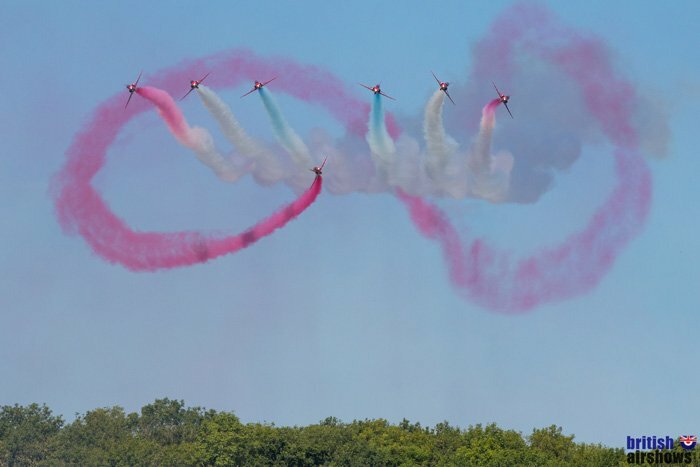 These UK military displays were all booked to fly both days, and most did, although the Red Arrows were unable to reach Surrey on Saturday because of a vicious storm at Brize Norton. This was one of the few shows to feature both the B-25 and the B-17. A true bonus was seeing these two WW2 bombers in the air together. On Saturday they performed a pairs flypast. On Sunday there was no flypast, but they did take off together. 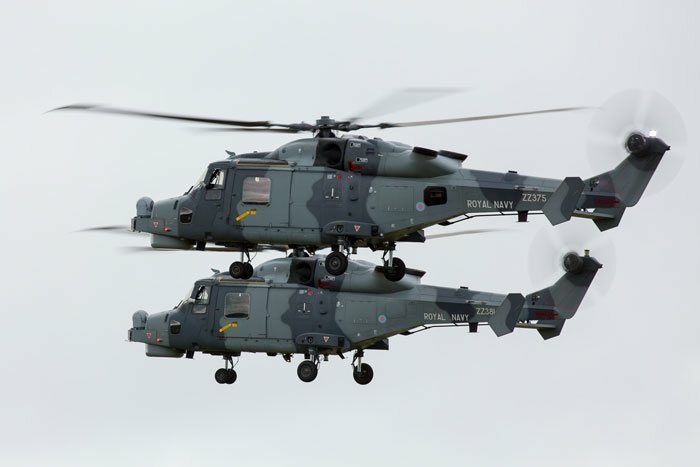 Another unscheduled bonus was a flypast by a Puma from RAF Benson on Saturday: a single, brief flypast, not as flamboyant as the flypast at Eastbourne earlier in the month, but a welcome surprise nonetheless. Saturday's weather had some brightness but it was dull much of the time. On Sunday the dull conditions dominated, with frequent rain showers. The Turbulent Team probably got the worst of it, not only because their display coincided with one of the heavier showers, but also because they fly with open cockpits. Nevertheless, they battled on and even managed a weekend record number of balloon bursts. Towards the end of Sunday the cloud was especially thick and low, so the commentators warned that the flying might be at an end before the Typhoon and BBMF Spitfires were due to appear. 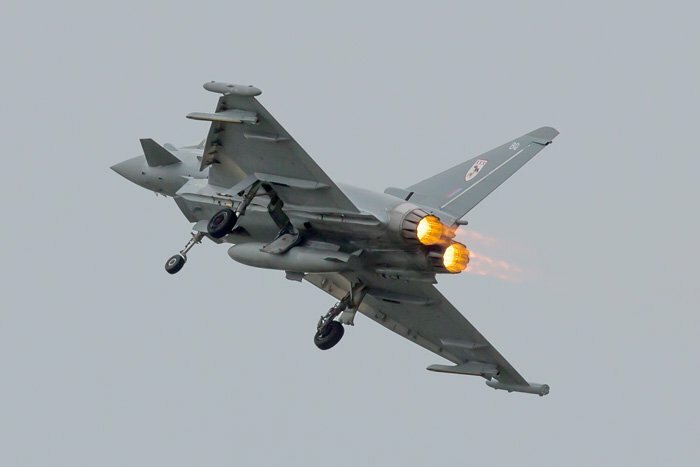 The sound of the Typhoon above the clouds appeared to confirm that pilot Mark Long had come for a look and everyone assumed that, as we could hear but not see him, he would have to call off the display. In reality Mark did decide to fly the display, which turned out to be one of the best of the weekend, with oodles of 'spluff' and after-burn flare, amply rewarding those in the crowd who had decided not to leave wet and early. Surprise stars were the Reds Duo: a pair of model Red Arrows planes flown by father and son team Steve and Matt Bishop, carrying out many of the manoeuvres familiar to fans of the full-size version. They are not new to Dunsfold but do seem to pull something out of the hat each time. Last year they saved the day when, in terrible weather, they were the only displays for some while. This year, when the real Red Arrows were unable to display on Saturday, Red 10 - the Red's manager and commentator - became the commentator instead for the mini version, much to his own surprise as well as that of the crowd. As an aero modeller himself he was clearly impressed by the performance of this world champion pair. There were other traditionally-powered and electric-powered models too, but the Reds were the top of the very impressive group. 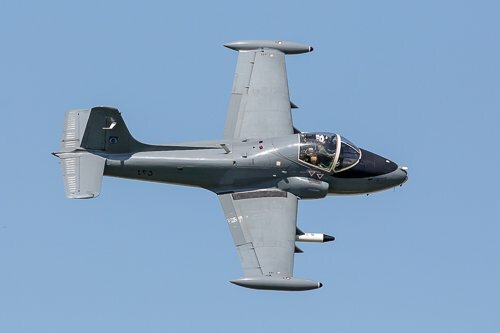 In a year when vintage jet displays over land have been rather scarce, following the tragic events at Shoreham in 2015, it was especially good to see the Vampire pair from the Norwegian Air Force Historical Squadron on their Dunsfold debut and Dan Arlett in Jeff Bell's Jet Provost T5. All displays are listed in the table and most will not be verbalised here but, deserving special note, the Aircraft Restoration Company's Hispano Buchón, flown by Steve Jones, was in its temporary coat, worn for the benefit of the 'Dunkirk' film; the Royal Netherlands Air Force Historic Flight B-25H Mitchell 'Sarinah' also wore a disguise representing the RAF’s 320 Squadron, largely composed of Dutch pilots and based at Dunsfold during WW2, who enjoyed a reunion at this year's show and, unique to Dunsfold, there was a fast(ish) VC10 taxi run on Sunday for those at the show early enough to catch it. There have been calls for more variety in the flying displays. To be fair there were débutantes at Wings and Wheels 2016, including Sally B and the Vampire pair. 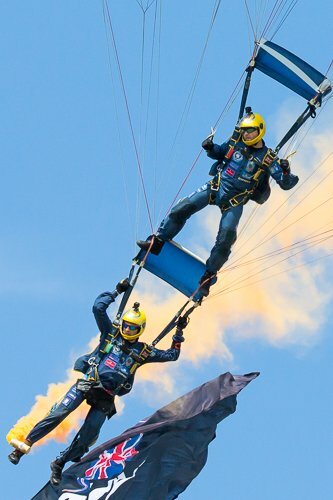 We also have to remember that this is a family show, so regulars such as the Turbulent Team and Wingwalkers (although absent this year) are expected in order to please the family part of the audience. 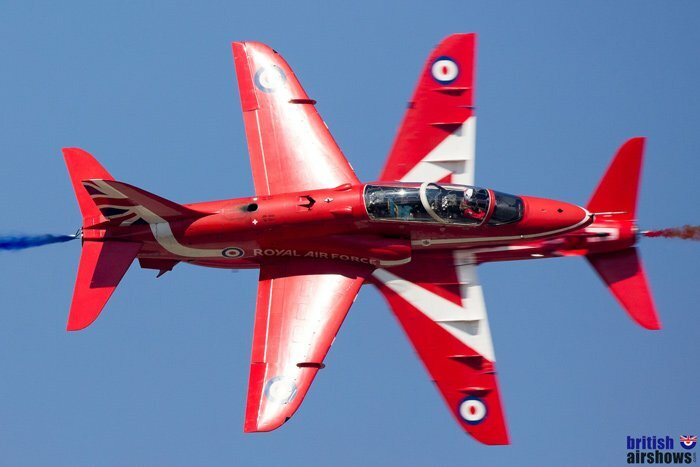 Nevertheless, a few changes such as the Wildcats or Team Raven instead of The Blades; a little more foreign participation and more combination flying would be good to prevent the event becoming stodgy for the regular airshow-goer. Even so, and as always, Dunsfold Wings and Wheels proved to be a first class air and motor show with plenty of variety for the whole family, including runway demonstrations of historic and modern supercars and bikes, an action arena with professional and amateur displays on a variety of bikes, extensive vintage military 'village' with vehicles and re-enactors, a static vehicle zone, lots of period entertainment, charity and trade stalls, rides and amusements - as well as 10 hours of flying over the 2 days. There were not a huge number of static aircraft (see the table), but a major plus at Dunsfold is that there are invariably interactive statics, that visitors can not only see but also interact with in some way, staffed by helpful personnel. This year there was a RN Mk2 Merlin that visitors could get inside and ask about. There is one airshow a year, invariably over the late August Bank Holiday weekend. Predominantly a show for families rather than an aviation purists, it offers fairground rides, stalls-a-plenty, circus-type antics and a well supported two- and four-wheel static and moving motor show as well as around 5 hours of flying each day: with virtually the same line-up on each of the two days. Hurricane BE505, Hangar 11 (Unserviceable. Replaced by BHHH Hurricane). Pick up the A281 from the A23, A24 or A29. The show ground is well signposted from the A281. Many of the roads, especially the last bit, are country roads which can get congested on show days, so allow plenty of time. There is free parking. National Express have coach services to Guildford and Horsham but not to Dunsfold. The normal local bus service, run by Arriva, does not operate over Bank Holidays (show days are over a Bank Holiday weekend). However, there is a service between Guildford bus station and the show four times a day, profits going to Help for Heroes. See the Wings & Wheels web site for details. There is no station at or within walking distance of Dunsfold. However, the London to Portsmouth line serves several stations nearby. The best to try are Guildford (10 miles) and Godalming (6 miles). The local bus service to the village does not run on Bank Holidays but from 2015 there has been a limited service direct between the show and Guildford four times a day. See this page on the Wings & Wheels web site for times and costs. Otherwise, a taxi is the only realistic option from the station to the aerodrome. Click the blue Expedia name for a list of hotels and guest houses near the show. The venue is already built into the link, so when the list comes up you just have to enter your dates and adjust the number of guests and rooms if necessary. For other hotels, the International Hotels Group have a Holiday Inn in Guildford, about 11 miles away and Premier Inn have hotels in nearby Godalming and Guildford.